Raul goes to boarding school. He doesn't belong to any groups and doesn't have many friends there. He looks after the little kids at school and tries to stay out of trouble with his vicious gym teacher. Every student at Raul's school goes home for the weekend. Raul has a secret though. He pretends to go while he's actually staying. The reason for that is a beautiful white wolf. When they run he feels like he's home, which is why spending his weekends outside is so appealing. Something changes for Raoul at school. He finally makes a friend, so he has the chance to share some of his life. He has a crush on a girl and there is a student who might be nicer than he seems. Is there someone Raul can trust with his secrets? He runs with a wolf and transforms, but he isn't a mean beast that kills and only comes out when there's a full moon, so he's certain he isn't a werewolf. What happens to him during the weekends and who is the white wolf that's always waiting for him? This Is Not a Werewolf Story is a fun book filled with beautiful words and wonderful magic. I immediately loved Raul. He's strong and resourceful and he's terribly brave. His father isn't good at taking care of him and his mother has left them, which is why he ends up at the boarding school. His existence is pretty lonely, but he makes the best of it. He doesn't have friends, but in the forest that doesn't matter, then he feels like he's found his right place in the world. The deep connection he has with the wolf is unique, which is something I liked very much. I also loved that the school is fabulously peculiar and I enjoyed reading about the teachers and the students. The inspiration for This Is Not a Werewolf Story comes from old folklore tales and I enjoyed what Sandra Evans has done with that information. She's skillfully used the amazing elements and turned them into a fascinating modern story. I absolutely loved that she's written her book with the help of her son, that makes it extra special. It's clear that there's much love and appreciation for the topic. I really enjoyed reading the vivid descriptions of Raul's adventures and his surroundings. The ending of the story is surprising and I liked the angle Sandra Evans has chosen. 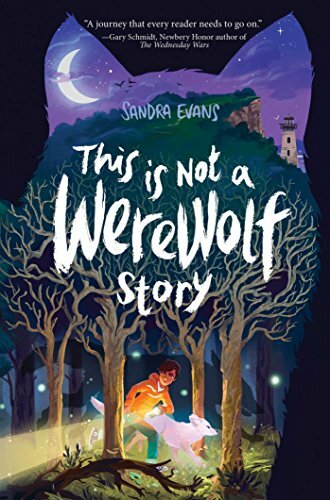 This Is Not a Werewolf Story is a fantastic book for both children and grownups. Oh, wow, I still love reading Fairy Tales. And reading debus - my favourite. I really want to read this, it sounds great! Sounds like a great modern fairy tale and with an unexpected ending too! Oh sounds like a fantastic read! I love stories inspired on old tales and Raoul sounds like a really special character. I also love that cover! I have some kids in my family that would love this book!